If you're looking for something extra special then this stunning cluster of luxury lodges set in the grounds of the impressive and historic thousand acre Gisburn park Estate are the perfect choice for you. The location in the heart of the Ribble Valley, inspiration for Tolkien's Lord of the Rings, has been designated an Area of Outstanding Natural Beauty and offers a gateway to exploring the magnificent Yorkshire Dales. 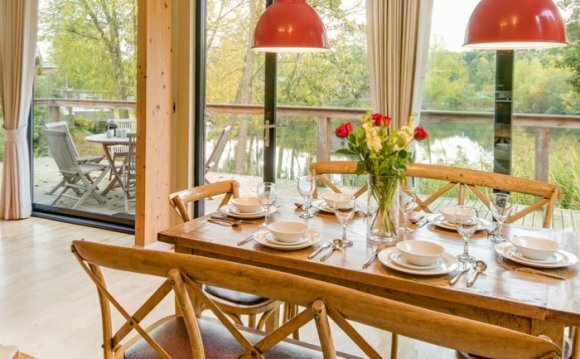 Each lodge has been stylishly designed with every home comfort in mind, effortlessly blending contemporary design with rural charm and nestled within prize winning gardens and water features. Enjoy your own private decking area with a sumptuous outdoor hot tub or take advantage of the on site massage therapist to really unwind. For those of you looking for something more energetic, the private cycle paths and walking trails through the Estate along the Ribble River are perfect. Nearby Pendle Hill offers a challenge to keen walkers who can reward themselves afterwards at the famous Assheton Arms in Downham village, the setting of the BBC's Born and Breed drama. Just a ten minute walk through the Estate from your lodge you'll discover the stunning market village of Gisburn, with a delightful pub, award winning Italian restaurant and quaint shops selling local organic produce. The Lancashire coastline, numerous market towns (Clitheroe, Skipton and Settle, all 10 mins), the Yorkshire Dales and Lake District National Park are all within easy reach. Taste the luxury of delicious, freshly prepared food delivered straight to your door - including Champagne, strawberries and clotted cream as the perfect accompaniment to romantic evenings in the hot tub! Add an extra personal touch to a special occasion with celebratory balloons/banners ready in-lodge for your arrival, and top the surprise with a sweet treat from our personalised cake service. Or simply indulge in the opulence of rose petals scattered on your bed, waffle bathrobe hire†, Millar Harris scented candles and toiletries, complimentary King Henry VI water and a late 12-noon† checkout... A full concierge service provides great local advice and friendly assistance with booking days out. Relaxing massages can be enjoyed on site. Cycle hire is also available. †Subject to availability.